Ulat Buku Geek: giveaway flash: holiday giveaway! 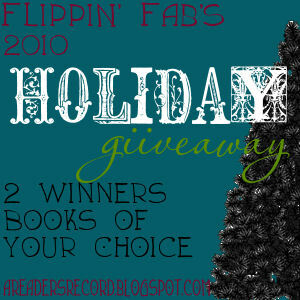 Flippin' Fabulous A Reader's Record is hosting a Holiday Giveaway! Open internationally and ends 12/23. Hurry up and enter! I'm grateful to have my family all home for the holiday. I'm also grateful everyone is healthy. We've had some cancer scares, but everyone has beaten it thus far.